In an attempt provide a more comfortable environment for meetings and other events within the church’s calendar, St Augustine’s decided to commission the design of an extension to the church that has been in Scaynes Hill, near Haywards Heath in West Sussex, since 1858. The beautifully designed building, including kitchen, servery and other amenities, was completed in 2014, upon which it was discovered that, unfortunately, the multi-purpose hall was not sympathetic to the spoken voice. Whenever two or more people came together in the hall and were more than a few feet apart they had trouble making out what each other were saying, such was the ‘sound-decay’. Anymore than a handful of people and the problem was exacerbated and everyone raised their voices to counteract the problem, which of course made it worse. 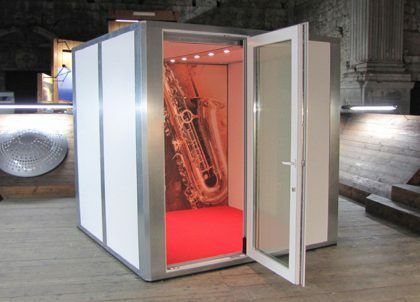 Having no ‘soft’ or ‘acoustically’ treated surfaces ensured the hard surfaces became even more reflective. Added to which the design of high angled ceiling spaces, into which sound dispersed, then reflected and threw out distorted sound. Think echo without the clarity. By adding fabric covered absorbor panels affixed to each angled ceiling section + one more each side of the serving hatch we predicted the reduction in RTs of over 1.5 seconds down to where it needed to be in the range of 0.8 and 1.2 seconds. Walking into the hall is no longer something to avoid. The sound is ideal for sit-down meetings, food and beverage events or just to relax in after service. The room is a calm and tranquil place and one where it is possible to just take it easy with friends and colleagues. 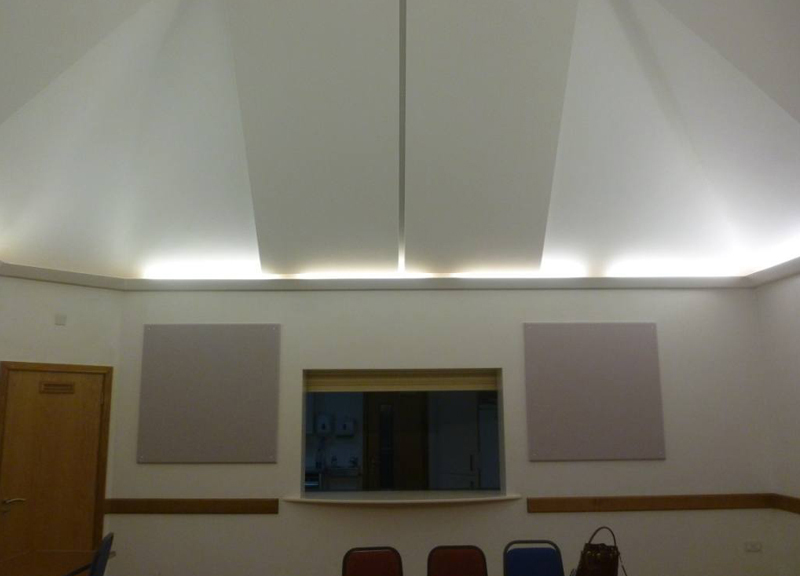 Just to let you know that we are very pleased with the newly-installed acoustic panels. 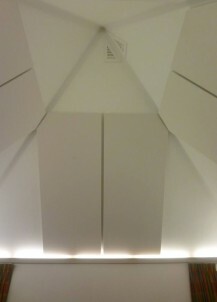 The appearance of the ceiling panels is most attractive and seems to enhance the design of the ceiling. The difference that the panels make to noise levels in the room is very much appreciated by all our church members. We can at last hear each other speak! I'm sure you will agree that the installers have done a very good job and we would like to thank them. Many thanks.